Carmakers hate risking billions of dollars more than they do already to compete in a low-margin industry, and so SoftBank stepped forward on May 31 to drop $2.25 billion into GM’s Cruise Automation unit. That will help finance the rollout of a driverless ride-hailing business next year. Google’s parent company doesn’t run factories, and so on May 31 the tech giant agreed to buy tens of thousands of minivans made by Fiat Chrysler. The vehicles will be outfitted with autonomous systems designed by Alphabet’s Waymo unit. The decision by SoftBank Vision Fund to buy nearly 20% of GM Cruise Holdings is a significant coup for the Detroit automaker. This is a company that pulled out of big car markets like Europe, Russia and India because the cash spent on new models there provided little return or losses. Self-driving cars cost a fortune without generating any revenue at the moment, and GM Chief Executive Officer Mary Barra doesn’t want to invest in anything that falls short of her push for 10% operating margins. Money is less of a constraint for Waymo and its parent company, which has more than $100 billion in cash. SoftBank approached the automaker and did exhaustive technological research before putting pen to paper on a deal, said a person familiar with the matter. While GM doesn’t necessarily need the cash, the company’s executives figured that bringing on SoftBank would represent a ringing endorsement in the tech world. In addition to backing a slate of ride-hailing startups, SoftBank also has invested in two chipmakers supplying many autonomous efforts: Nvidia and ARM Holdings. Questions remain about the timeline for expansion. A statement released May 31 said Waymo would buy “up to” 62,000 vehicles, without details on when. A fleet that size would be large enough to offer a scaled ride-hailing service in two to three markets, according to one industry insider. John Krafcik, Waymo’s CEO, has a favorite catchphrase: “We’re not building cars; we’re building better drivers.” The slogan is a sales pitch for Waymo’s package of software and sensors, which many experts characterize as the best in class. It’s also a dog-whistle to the car industry — a way to dampen concerns that Alphabet, the world’s third largest company, is planning to manufacture its own vehicles. 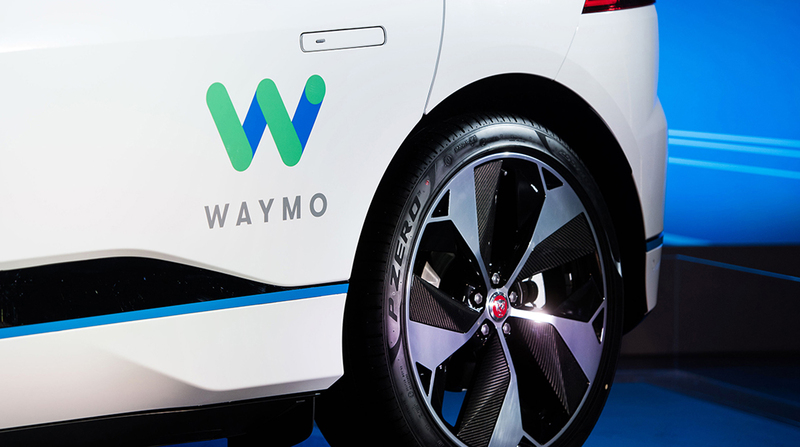 That has left Waymo to create a fleet for its futuristic driverless business using existing vehicle models such as the Chrysler Pacifica and the Jaguar I-Pace. For now, at least, Waymo integrates its software into cars designed with gasoline engines and a driver in mind. GM uses a modified version of its own Chevrolet Bolt, an electric car that has more power on board to handle the intensive computing requirement. The version used by Cruise in current road tests is a third-generation car that eventually will have the steering wheel and pedals removed. For years before the project was rebranded as Waymo, Google weighed the option of making its own cars and even produced a prototype. Ultimately, Google’s cofounders opted to work with existing carmakers. In 2015, shortly after Krafcik joined, Waymo tried to cut a major deal with Ford. He told Bloomberg News earlier this year that the talks collapsed when Alphabet decided it bore too much capital risk in the arrangement. Part of Waymo’s announcement May 31 included a pledge to sell self-driving cars for private ownership, something GM hasn’t yet discussed. The technology is still extremely expensive, and some experts doubt ownership will be competitive with ride-hailing services built on driverless vehicles. “By the time personal car ownership is feasible, it won’t be desirable,” said Anne Widera, a self-driving consultant who has worked at Waymo and Uber. Selling cars outfitted with self-driving sensors would also risk that the intellectual property on board could be copied. In a way, Waymo’s tactic of finding someone else to make its cars fits the classic mold of its parent business: controlling the valuable artificial intelligence and data running through self-driving cars, without making the hardware. That may change, though, as parts of Alphabet’s empire have recently shifted toward creating more hardware — Google’s own gadgets and cloud-computing chips, as well as Waymo’s sensors — to exert more control over the product.